Northants Bowling Federation have their sights trained on only a third ever appearance in the final of the Derbyshire Trophy, the national inter-county indoor championship. The target is 23 points from the 28 available from their home matches against Lincolnshire and Norfolk, with Hunts sitting at the top of the southern section having completed their programme with three wins and a draw, the latter against Northants. The first test is at home to Lincolnshire, last year’s beaten finalists, at Peterborough & District this Sunday morning, followed by a visit from Norfolk to Stamford the following weekend. Team captain James Harford remains optimistic that his team can deliver the goods. “With two home games to come, this leaves us with the best chance we have had in recent years to qualify,” he commented. Former England international Tristan Morton, now playing his indoor bowls out of the City of Ely club, has been drafted into the team as Northants bid to reach April’s national final at Newark for the first time since 2006 when they made it two wins in two final appearances, the first coming in 1996. Northants: Brian Martin, Bob Warters, Joe Randall; Howard Ship, James Harford, Tristan Morton; Paul Dalliday, Phil Afford, Simon Law; Nick Wilkie, Neil Wright, Roger Martin. MEN’S SINGLES, second round: Simon Law bt Michael Humphries 21-2; Joe Randall bt Jeff Pitt 21-7; Adam Warrington bt Josh Clark 21-5; Richard Allam bt Chris Ballard 21-17.
bt Pete Harvey 24-11; Nick Wilkie bt Jeff Pitt 20-10; James Harford bt Josh Clark 20-10; Neil Wright bt Bill Orme 30-6; Paul Bailey bt John Holroyd 20-15; Peter Edwards bt Cliff Watson 20-15. Walkovers: Adam Warrington, Bob Warters. MIXED PAIRS, first round: Stephen Harris bt Cliff Watson 17-13; Neil Wright bt Martyn Dolby 21-14; Mick Duell bt Richard Allam 19-16; Joe Martin bt Paul Bailey 14-9; Peter Edwards bt Doug Want 21-8; Derek King bt John Holroyd 19-13. Walkovers: Nick Wilkie, Mike Ramsden. VETERANS SINGLES, first round: Martyn Dolby bt Pete Harvey 21-8; Mike Ramsden bt George Cameron 21-11; Bob Warters bt Joe Martin 21-7; Derek King bt Doug Want 21-12; John Thurston bt Bill Orme 21-19; Peter Edwards bt Tony Barwell 21-15. 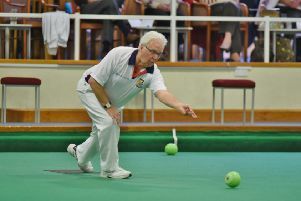 MIXED TRIPLES, first round: Derek King bt Brian Bassam 23-19; Paul Bailey bt Peter Edwards 20-19; Bob Warters bt John Holroyd 21-20; Michael Humphries bt Richard Montgomery 23-11; Jeff Pitt bt Mick Linnell 27-9; Nick Wilkie bt June Brennan 19-15. WOMEN’S SENIOR SINGLES, first round: Shirley Suffling bt Pat Jones 21-9; Joan Robinson bt Jenny Harvey 21-10; Chris Ford bt Carol Warters 21-20; Elizabeth Wallace bt Sheila Craig 21-14.
n The Peterborough senior men’s team kept up the pressure on Cambs League leaders Cambridge Chesterton A with a crucial 7-3 victory away to third-placed City of Ely A.
Chesterton returned to the top with a 10-0 win against lowly Huntingdon B, but Peterborough, who have lost only one game all season, are just two points behind in what is a two-horse race for the title, with the third-placed team a massive 25 points adrift. There were rink wins for Mick Linnell and Mick Duell, while team captain Rod Maplethorpe’s rink drew as Peterborough edged over the line by just four shots – 68-64. Les Sharp, John Barker, Terry English, Mick Linnell won 17-11. Joe Martin, Steve Johnson, Phil Afford, Mick Duell won 19-16. Norman Gray, Graham Jackson, Mick Greaves, Rod Maplethorpe drew 19-19. Terry Corney, Don Paul, Ean Eagle, Ray Keating lost 13-18.